Facility of the Year Award nominations – Last call! 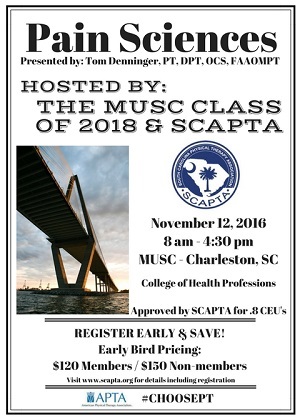 Submit this form to southcarolina@apta.org by Sept. 30th to be considered for feature in the Chapter's newsletter and website. If the facility meets the award criteria, it will appear on the Chapter's website and in one of our weekly newsletters during the month of October, which is PT Month. If this facility is selected as the Facility-of-the-Year, the contact identified below will be notified in mid-February so representatives from the facility can plan to attend the Chapter's Annual Conference to accept the award. Representatives may attend for free the Business Meeting and Lunch at which the award will be presented but must RSVP by the early bird. Representatives wishing to attend other aspects of the conference may do so, but will be required to pay any related registration fees. SCAPTA has the right to not highlight a facility.